As school districts implement initiatives that bring computer science (CS) to academically diverse K-12 schools, they face heightened demands for supporting teachers in meeting the needs of a broad range of learners. However, limited knowledge exists about pedagogical approaches to teaching CS, especially to students with disabilities. This paper reports findings from a qualitative study of two CS instructional coaching models meant to support teachers in meeting the needs of diverse learners, including those with disabilities. One model involved a school-embedded coach and the other model involved a district-wide coach that traveled among multiple schools. Findings revealed that within both coaching models, co-planning and co-teaching played an integral role in supporting teachers in meeting the needs of students with disabilities. Instructional pedagogies that coaches promoted included scaffolded project planning, student collaboration, and immediate feedback to students. Within both coaching models, there was a focus on trust building and increasing teachers’ instructional skills. Differences between coaching models included a stronger level of familiarity between the coach and teachers in the school-embedded coaching. There were also different approaches to accountability and co-planning logistics. Israel, M., Ray, M.J., Maa, W.C., Jeong, G.K., Lee, C.e., Lash, T. & Do, V. (2018). School-embedded and district-wide instructional coaching in K-8 computer science: Implications for including students with disabilities. 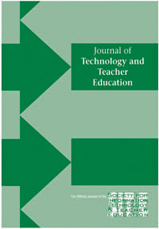 Journal of Technology and Teacher Education, 26 (3), 471-501. Waynesville, NC USA: Society for Information Technology & Teacher Education. Retrieved April 22, 2019 from https://www.learntechlib.org/primary/p/181938/. Alarcon, G.M. (2011). A meta-analysis of burnout with job demands, resources, and attitudes. Journal of Vocational Behavior, 79(2), 549–562. Bettini, E., Jones, N., Brownell, M., Conroy, M., Park, Y., Leite, W., Crockett, J., & Benedict, A. (2017). Workload manageability among novice special and general educators: Relationships with emotional exhaustion and career intentions. Remedial and Special Education, 38(4), 246-256. Braught, G., Eby, L.M., & Wahls, T. (2008). The effects of pair programming on individual programming skill. Proceedings of the 39th SIGCSE technical symposium on Computer science education. Pp. 200-204. Cantrell, S.C., & Hughes, H.K. (2008). Teacher efficacy and content literacy implementation: An exploration of the effects of extended professional development with coaching. Journal of Literacy Research, 40(1), 95-127. Cohen, J. (1968). Weighted kappa: Nominal scale agreement with provision for scaled disagreement or partial credit. Psychological Bulletin, 70(4), 213– 220. Collet, V.S. (2011). The Gradual increase of responsibility model: Coaching for teacher change. Literacy Research and Instruction, 51(1), 27-47. Cornett, J., & Knight, J. (2009). Research on coaching. Coaching: Approaches and perspectives, 192-216. Denton, C.A., & Hasbrouck, J.A.N. (2009). A description of instructional coaching and its relationship to consultation. Journal of Educational and Psychological Consultation, 19(2), 150-175. Desimone, L.M., & Pak, K. (2017). Instructional coaching as high-quality professional development. Theory Into Practice, 56(1), 3-12. Halbesleben, J.R.B., Neveu, J.-P., Paustian-Underdahl, S.C., & Westman, M. (2014). Getting to the “COR.” Journal of Management, 40(5), 1334–1364. Israel, M., Pearson, J., Tapia, T., Wherfel, Q., & Reese, G. (2015). Supporting all learners in school-wide computational thinking: Across case analysis. Computers& Education, 82, 263-279. Jordan, A., Schwartz, E., & McGhie-Richmond, D. (2009). Preparing teachers for inclusive classrooms. Teaching and Teacher Education, 25(4), 535-542. Knight, J. (2009). Instructional coaching. In Coaching: Approaches and Perspectives (pp. 29–55). Thousand Oaks, CA: Corwin Press. Ladner, R.E., & Israel, M. (2016). “For all” in computer science for all. Communications of the ACM, 59(9), 26–28. Lewis, C.M., & Shah, N. (2015, July). How equity and inequity can emerge in pair programming. In Proceedings of the eleventh annual International Conference on International Computing Education Research (pp. 41-50). McChesney, I. (2016). Three years of student pair programming: Action research insights and outcomes. Proceedings of the 47th ACM Technical Symposium on Computing Science Education. Pp. 84-89. McDowell, C., Werner, L., Bullock, H.E., Fernald, J. (2006). Pair programming improves student retention, confidence, and program quality. Communications of the ACM, 49(8), 90-95. Merriam, S.B. (1998). Qualitative research and case study applications in education. San Francisco, CA: Jossey-Bass, Inc.
Ray, M.J., Israel, M., Lee, C., & Do, V. (2018). Across-case analysis of instructional strategies to support participation of K-8 Students with disabilities in CS for All. In Proceedings of the 49th ACM Technical Symposium on Computer Science Education (pp. 900-905). ACM. Ryoo, J., Goode, J., & Margolis, J. (2016). It takes a village: Supporting inquiry-and equity-oriented computer science pedagogy through a professional learning community. Computer Science Education. Snodgrass, M.R., Israel, M., & Reese, G.C. (2016). Instructional supports for students with disabilities in K-5 computing: Findings from across-case analysis. Computers and Education, 100, 1–17. Stake, R.E. (2006). Cross-case analysis. In R. Stake (Ed. ), Multiple Case Study Analysis (pp. 39–77). New York: Guilford. Taylor, M.S., Vasquez, E., & Donehower, C. (2017). Computer programming with early elementary students with Down Syndrome. Journal of Special Education Technology, 32(3), 149–159. Tondeur, J., van Braak, J., Ertmer, P.A., & Ottenbreit-Leftwich, A. (2016). Understanding the relationship between teachers’ pedagogical beliefs and technology use in education: A systematic review of qualitative evidence. Educational Technology Research and Development, 65(3), 555-575. Weiner, H.M. (2003). Effective inclusion: Professional development in the context of the classroom. TEACHING Exceptional Children, 35(6), 12-18. Werner, L.L., Hanks, B., & McDowell, C. (2004). Pair-programming helps female computer science students. Journal on Education Resources in Computing 4(1), Article No. : 4.